DynaQuip Controls Corporation, now in our 77th year, continues our long standing commitment to designing and manufacturing superior products and providing outstanding personal service. Electric actuators and valve automation designs lead our drive as we focus on the flow control products of tomorrow. DynaQuip’s expertise is rooted in the design, development and manufacture of durable flow control and fluid connector products for industrial applications. Today our product and design focus includes electric actuators, electronic actuator controls, automated ball valves, automated butterfly valves, pneumatic actuators, manual ball valves and butterfly valves. Our vision and goals stay firmly focused on the development of quality ideas and innovative flow control products. We back our products with our caring and personalized DynaQuip service. We are honored to serve the needs of our many customers and end users in the industrial, oil and gas, food and beverage, fluid power, OEM, commercial, and residential markets. You have a product line called WaterCop, what is it and what does it do? WaterCop is an automatic water shut-off system designed to detect common plumbing leaks and quickly shut of the main supply line to help prevent water damage to the home or property. WaterCop systems employ an electronic ball valve on the main water line and a robust network of flood sensors installed near water-using appliances and in areas where running water is present. When a water leak is detected, a wireless signal is instantly delivered to close the WaterCop electronic valve. WaterCop’s quick action halts the flow of water to all areas of the home and any continuous flooding is stopped. Tell us the story behind the development of the WaterCop. Like many novel products WaterCop was born out of adversity. In late spring 1998 I arrived at my family’s Florida townhouse to discover a water leak disaster. The small home was a complete wreck! Instead of enjoying a long weekend of golf, fishing and friends I spent three days cleaning, drying, and laboring to removed damaged carpet, walls, cabinetry and the like. I spent hours with insurance claim and water damage specialists. Needless to say, there was no vacationing for me that weekend. On the flight home to St. Louis I began to sketch out an automatic valve system, employing our industrial valve components, so that I could build a system to prevent this from happing to our home again. Upon my return to my office, further research indicated that this was a very common homeowner issue and an enormous and costly insurance claims issue nationwide. Working together with Mike Purvis, our longtime Design Engineer, we built WaterCop. We introduced the first generation WaterCop system to the market by late 1999 and received a patent on WaterCop in early 2001. Since then, nearly 100,000 WaterCop systems have been installed worldwide. WaterCop continues to evolve and grow. Now well into its 3rd generation of continuous design improvements, DynaQuip offers a complete family of WaterCop related automatic shut-off systems and devices. Why should homeowners and businesses be concerned about plumbing leaks and water damage? Property damage caused by aging and faulty plumbing is one of the most common home insurance claims. Sadly, it is also the most ignored threat until it’s too late. Every year more than 2.5 million homeowners fall victim and the household damages total multiple billions of dollars in preventable losses. Valuables such as artwork, antiques, computers and electronic data, photographs, and other heirlooms are often difficult or impossible to fully replace. Insurance helps ease the pain of repairs but will not fully replace your valuable property or alleviate the hassle, anguish, and disruption associated with a devastating interior flood loss. Flood damage and losses related to plumbing problems can lead to higher home insurance costs and possibly the loss of affordable coverage altogether. The WaterCop system, when properly installed and maintained, offers a proven method to effectively reduce the chance of catastrophic plumbing related flooding. Give us an idea on the installation of WaterCop, is this a DIY job, does it require a plumber or other professional installation? Adherence to all local and municipal building, plumbing, and electrical codes as they pertain to the WaterCop is very important. Codes in some regions may require that a licensed plumber be employed to do the installation, or that the proper permits be obtained prior to any installation. Even if local codes do not require a licensed plumber to do installation, it is necessary that the installer has a high level of competence in both plumbing and electrical skills to perform this installation. Our instructions assume this relative level of knowledge and skill. If in doubt, we recommend that homeowners use an Authorized WaterCop Dealer or contact a licensed plumbing professional. How do WaterCop systems protect against common plumbing floods. WaterCop Automatic Water Shut-off systems provide your home or office with around-the-clock indoor flood protection. WaterCop offers both wired and wireless flood sensors, wired wall switches, and is able to integrate directly with most home security and home automation systems. When water leaks are detected the water main valve is immediately and automatically closed thus preventing further catastrophic water damage. Homeowners can also choose to be remotely notified via text or email when WaterCop is integrated with our WIFI module or other security and home automation devices. Explain how the insurance industry views water damage and loss mitigations solutions like the WaterCop. Insurance claims associated with mold have been receiving increased attention in recent years. The cost of severe mold claims has been the focus of concern in many states. Damage from mold, such as rust, rot or mildew, is specifically excluded in standard homeowners and commercial property policies. If mold contamination is the result of a covered peril (i.e. water from a burst pipe), some insurers cover the damage up to a stated limit or up to the limits of homeowners insurance coverage purchased by the policyholder. Mold caused by water from excessive humidity, leaks, condensation or flooding is a maintenance issue for the property owner (like termite or mildew prevention) and is not covered by the policy. According to the website Insure.com and other home insurance industry experts, water damage is the most common cause of homeowners’ insurance claims. Many policies do not cover water damage caused by floods but will help with burst pipes, presuming there is no evidence of negligence by the homeowner. Some insurance companies recommend or even require an automatic leak-detection system to get or keep coverage and sometimes offer premium discounts for policy holders that install a WaterCop system. Congratulations on WaterCopPRO Integrated winning an Innovation award at ESX (Press Release). What did the judges see in the product to merit the award? Like all WaterCop systems, WaterCopPRO Integrated quickly detects and automatically stops common plumbing floods. It features a conveniently located Water Control Panel that is wired to our WaterCop electronic ball valve installed in the main water line. When a water leak is detected by wireless or hard-wired sensors, an alarm signal is sent to the Water Control Panel causing it to immediately close the water valve to minimize water damage. The Water Control Panel is equipped with trouble and alarm contacts and can be easily integrated into most home security and automation systems. This new system offers added terminals for a relay to operate an additional valve or other ancillary devices such as a well pump. The WaterCopPRO Integrated Kit comes with the Water Control Panel, actuator, power supply, and connector cable (available in 25ft, 50ft, and 75ft) for flexible installation options. System options include dual shut-off valves, outdoor shutoff valve(s) and options to accommodate extended pipe sizes up to 36in for commercial applications. How can WaterCop systems integrate into the “Smart Homes” of today and beyond? The Water Control Panel is equipped with trouble and alarm dry contacts and can be easily integrated into most home security and automation systems using the on-board contacts connections. 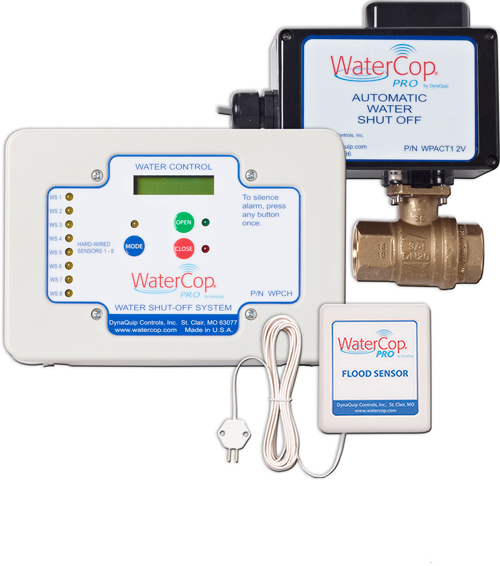 Our WaterCop family of systems also includes a version compatible with Z-Wave protocol technology. For homes that already have integrated alarm-type leak-detection systems, but lack the ability to close the water supply, WaterCop has a Low Voltage Wired Actuation solution. It is installed in the water main like the WaterCop, but is wired into the security panel so if the 3rdparty sensor network in their home detects a leak it immediately shuts the water off to complete their leak protection. Additionally, because most WaterCop systems have push button, on demand open/close control of a home’s water supply, they provide considerable peace of mind for seniors choosing to age in place. Smart homes are gaining in popularity, however every home can be ‘smarter’ when it is protected against preventable water damage. Our product lines and design expertise include electric actuators, electronic actuator controls, automated ball valves, automated butterfly valves, pneumatic actuators, manual ball valves and butterfly valves. With our vision and goals focused on the development of quality ideas and innovative control products, and backed by our caring and personalized DynaQuip service, we are honored to serve the needs of our customers and end users in the manufacturing, oil and gas transmission, food and beverage, fluid power, OEM, semiconductor, light industrial, residential, and commercial markets.